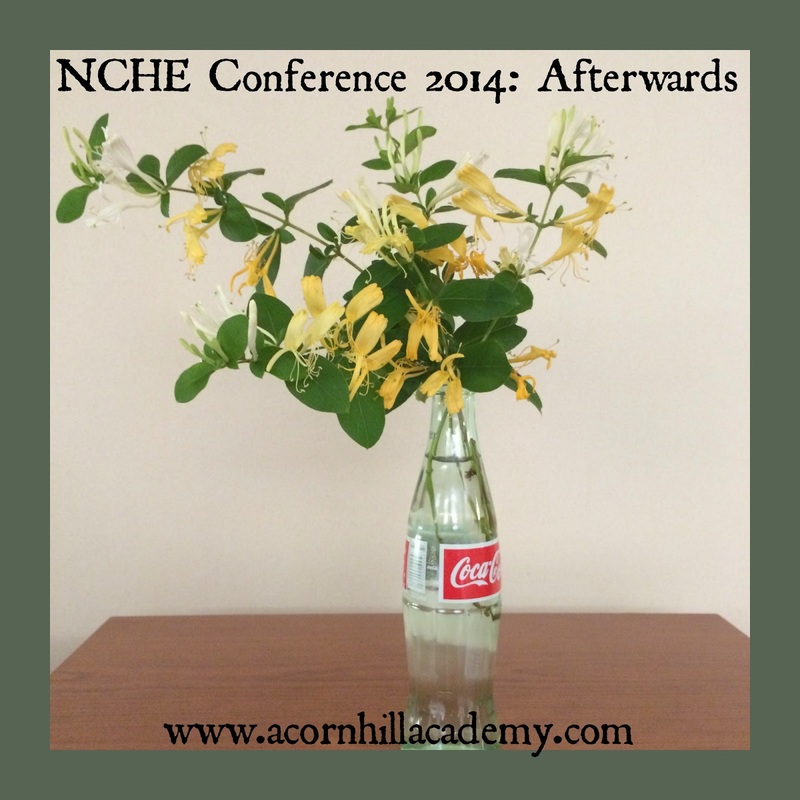 This was my first year attending the North Carolinians for Home Education (NCHE) Conference, other than the book fair. I had a wonderful time hanging out with old friends and making new ones. I was especially grateful to have my friend Pam as my roomie. She picked some Japanese honeysuckle and brought it to brighten our little hotel room, because she's awesome like that. I just love her and had the best time talking to her, far too late into the nights. I also had a lovely time meeting the other conference bloggers, and putting faces with the names of the lovely women I've worked with for the last few months, getting the word out about the conference. I'm so grateful for the opportunity! 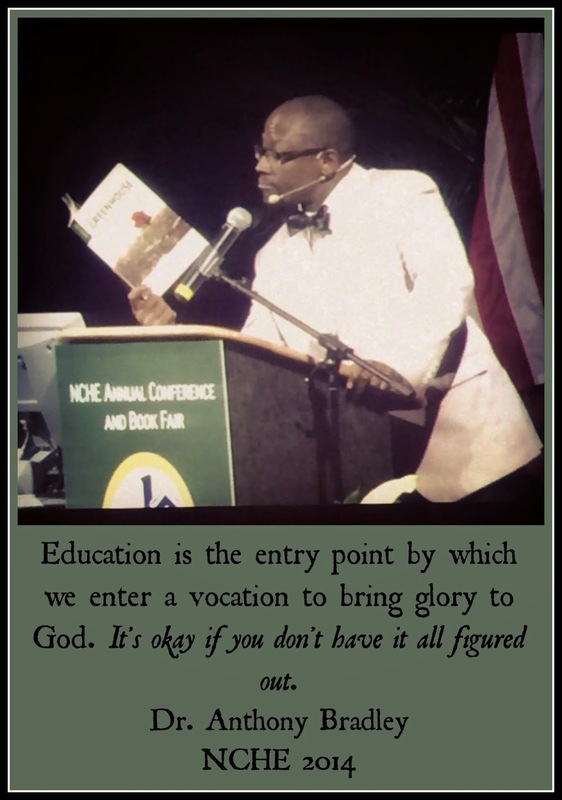 One of the most powerful sessions I attended was the first keynote, given by Dr. Anthony Bradley from Kings College in New York, titled "Teaching Children to Live as the Image of God Rather than Society's Definition of Success.". I had never heard of him before, and I'm glad I had the chance to hear him speak. It was worth going to the conference for this session alone. 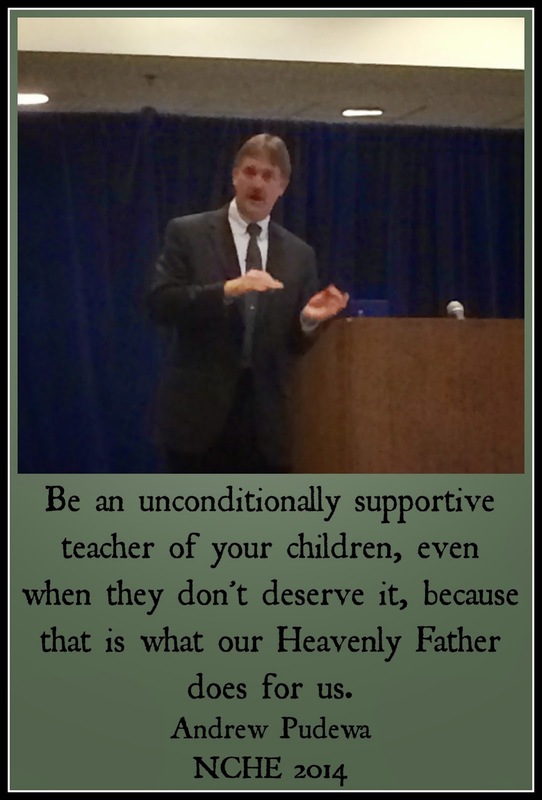 He talked about the ways our culture creeps in and keeps our children from living the lives God created them to live, not least of these being the expectation that everyone should be doing something "extraordinary." He said we are already extraordinary, because we are created in the image of God, called to love God and love our neighbors wherever God puts us. He quoted 1 Thessalonians 4:11, which encourages believers to live quiet lives, mind their own business and work with their hands. Doesn't that give you a sense of overwhelming peace? I am able to do that - I can love God and love my neighbors where I am, and I can show my children how to do that. 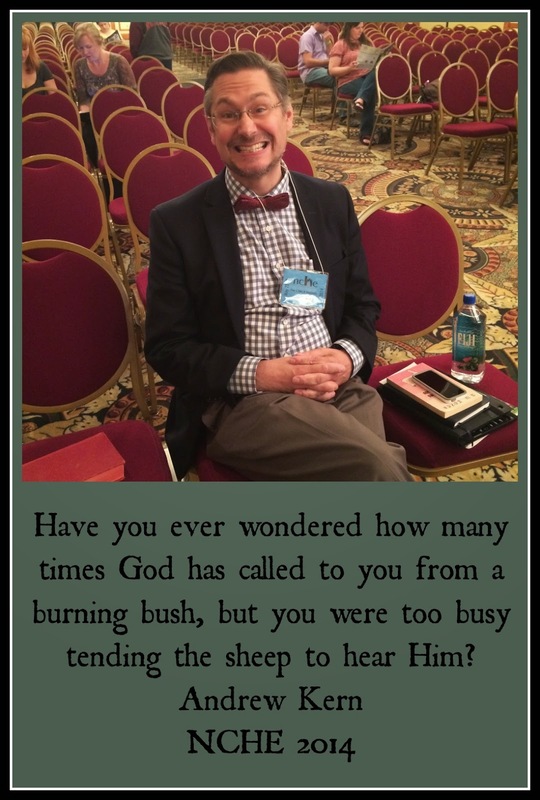 Dr. Bradley has an interesting website called What Is Your Salvation For? might grow up and marry one day. He was so much more eloquent than I am, but you get the gist. The final session I heard was given by Diana Waring, and it was called "Things I Wish I'd Known." 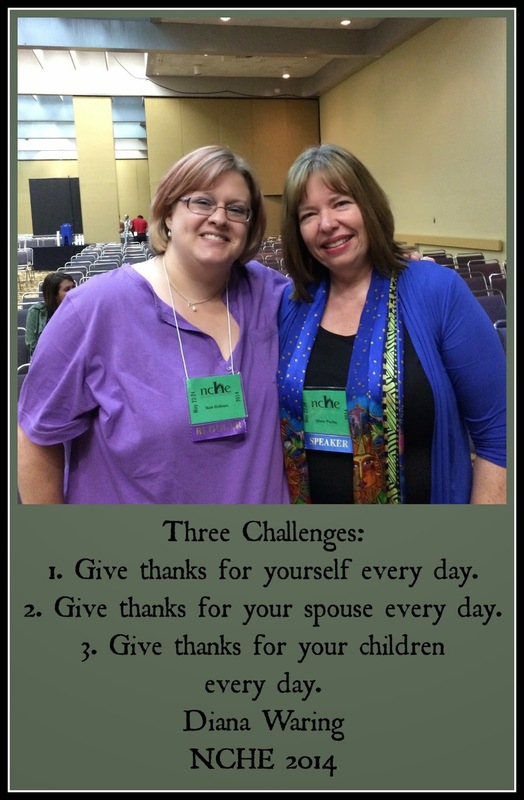 She gave us three challenges: to pray for ourselves, our husbands (she had all the men leave the session), and our children, every day. As I'm typing this, I realized I'd already forgotten the challenges, and I have renewed my intention to carry them out. I believe praying over my family every day will make a huge difference to all of us, and learning to be thankful for myself (not in a "look how awesome I am" way but from a "God made me who I am on purpose, and I am created in His image" perspective), while a challenge, is important. She reminded us that "Days drag, but years fly." I am facing my oldest child being in 9th grade next school year (I can't even bring myself to call it high school) and that struck a chord in my heart. It reminded me to be thankful for the time I have them and not waste it. After I heard her speak at this session, I wished I'd gone to all of her other ones. She is a beautiful woman, inside and out. I also spent a fair bit of time checking out the book fair - who doesn't love looking at all those beautiful books? My very favorite vendor, Books Bloom, was there, and I managed to snag a couple of books even though my funds were limited. My friends Liz and Emily from Living Books Library were there, as well as my friends Lisa from Yesterday's Classics and Hilda, another homeschool librarian, helping out in the Books Bloom booth. I had a fabulous time talking with the folks at the CiRCE Institute booth, and learned that they are only an hour from me so I could go hang out with them if I wanted! I'm so glad I went. I learned more than I expected I would, and it's always lovely to hang out with other homeschoolers, because they understand this often crazy life we've chosen–the good, the bad, and the ugly. God had a lot to say to me through the speakers I heard, and I will share more about that later. If you're within driving distance of Winston Salem, I encourage you to consider coming to the conference next year! You won't regret it. It was great to meet you! Dr. Bradley's keynote was one of my favorite sessions too! It sounds like it was a great conference. It has been a few years since I went to one.